Long Weekend in Venice (1/2). 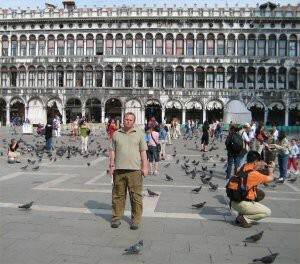 It’s more than a decade, since I visited Venice, while interailing around Europe. We decided on a return visit, with a hotel, rather than sleeping overnight on a train. 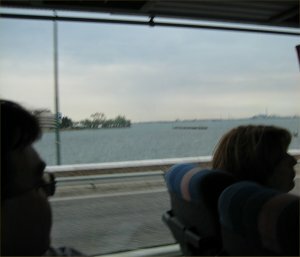 Our first sight of Venice, is this amazing view, as the road on stilts heads out across an enormous Lagoon, that houses the Canals and buildings of Venice. Our 2nd sight of Venice isn’t so inspiring. 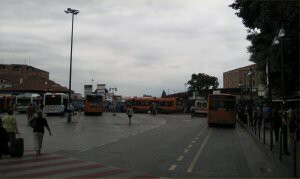 The Bus station, was a bit drab. Traditionally there have only been 3 bridges that cross the “reverse s”). Its possible to get a boat direct from the bus station, to St Marks square where we were staying, but we decided to get out and enjoy the weather. 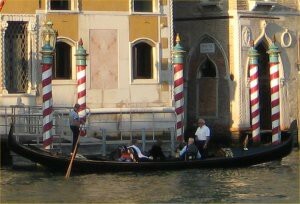 We wander along, next to the Canal, looking at the amazing buildings and Gondola’s for hire. 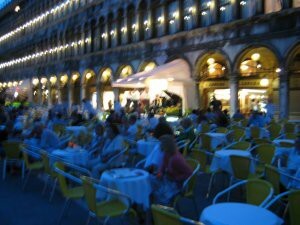 Our hotel was right next to St Marks square, and one side of it, was next to the main Gondola Taxi rank. Inside, the hotel was lovely, and the staff very polite and helpful (which reassured me about using expedia, after my experiences in Beijing). After the stress of travelling, we unpacked our bags, got showered and changed, and headed out to see the sights. After a quick wander around the square, we decided to get something to eat. 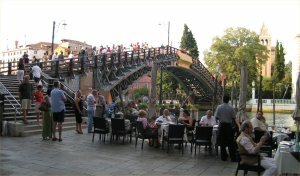 We found a restaurant next to the academia bridge (built in the 1930’s out of wood, as a temporary solution, it remains there to this day). Two superb Pizzas and an exquisite bottle of wine follow. 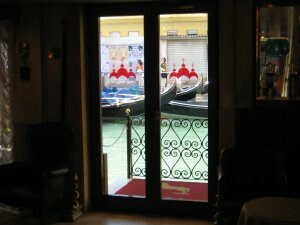 As we enjoyed our evening meal, we could see Gondola’s sailing along the Grand Canal. 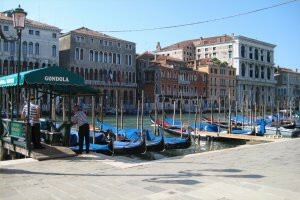 A common misconception (probably due to Cornetto ice-cream adverts) is that the Gondola pilot, will immediately break into song, as you set of on your journey. In reality, this doesn’t happen at all. In this picture however, a couple had hired a Gondola, pilot and a professional opera singer to serenade them on their journey. 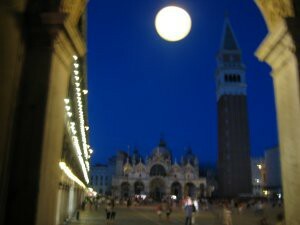 As it begins to get dark, we walk back towards Saint Marks square. Hundreds of restaurant tables were placed out in the square for dinning (we decided not to eat here, as we had been told it was very expensive). A Jazz band had a stage set up, and the square filled with music. Probably the best technical picture I have taken so far. Having finally worked out how to keep the shutter open on my camera, and holding the camera really steady, I was able to take this shot of the square at night, with the moon in the background. 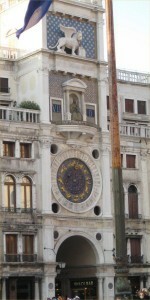 The famous 15th Century astronomical clock. 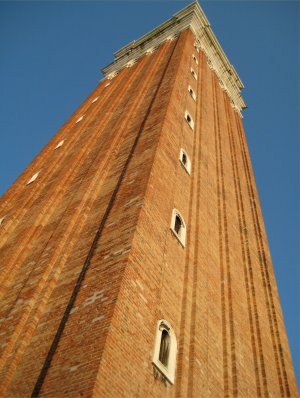 I took this shot of Campanile, sitting on my back. As stated before, one of the problems with short breaks, is the lack of time to queue. A shame really, I would have loved to see the view from the top of the clock tower. Originally built in 1172 as a lighthouse, to aid navigation across the lagoon. It collapsed with little warning on the 14th of July 1902, and had to be rebuilt. 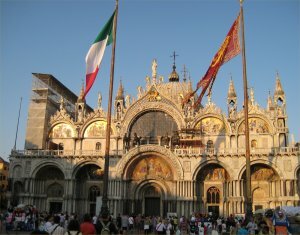 The Basilica of Saint Mark. 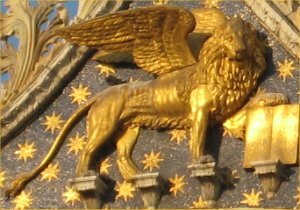 Photographed up close, on the Basilica, is the symbol of Venice, the Bronze Lion of St Mark (The Winged Lion). A closed shot from the side, shows the stupendous architecture and its Byzantine influences. 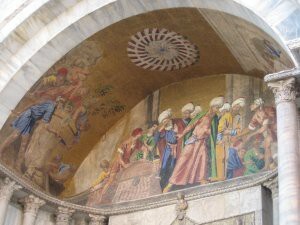 One of the famous Facade Mosaics. This shows the smuggling out of Alexandria of St Marks body, reputedly under slices of port to deter prying Muslims. 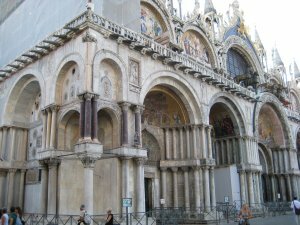 Next to the Basilica, the Doge’s palace. I found out that the famous adventurer and seducer Casanova, was one of the few people ever to escape from the Palace Prison. 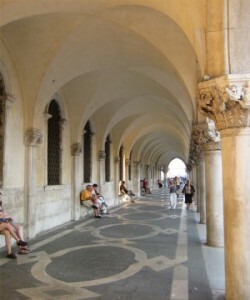 Photo showing the walkway next to the doges palace. Casanova left the Piombi on the night between 31 October and 1 November 1756. Digging up the wooden planks with a makeshift tool he climbed out of his cell onto the roof and then down into an attic. Crossing the whole palace he reached the golden staircase where he was seen by a guard who mistook him for a politician who’d been locked in and let him out. 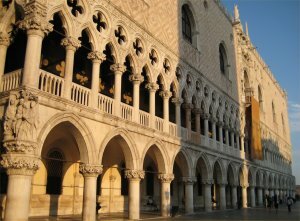 A legend says he stopped for a coffee in San Marco square before fleeing by sea on a gondola. 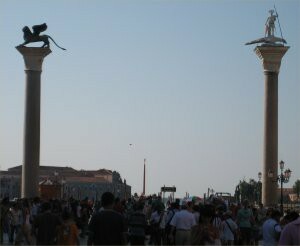 Columns of San Marco and San Teodoro. When the sacking of Constantinople was completed 2 huge columns of granite were removed and erected in the square in 1172. 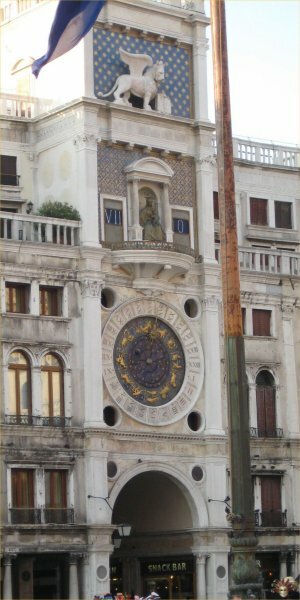 They marked the entrance to the City of Venice, in the days when the City could only be reached by Ship from the Lagoon. 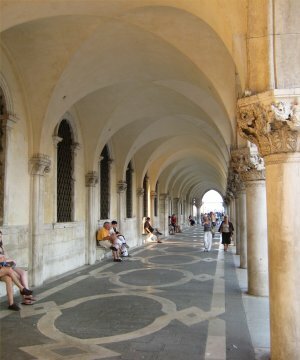 At one time, criminals were executed there, and even today, superstitious Venetians will not walk between the Columns. 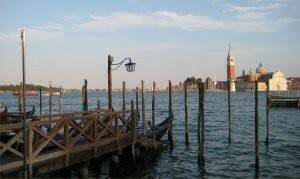 Beyond the columns, A view out across the Lagoon, from the docks at St Marks Square.